For the past few weeks all any serious film fan has heard about is Birdman. Birdman this, Birdman that, Birdman everything. Liking to remain as spoiler free as I possibly can before seeing a film, the only knowledge I had of the much talked about picture was in the various and extremely confusing trailers and snippets from TV and online press. Upon entering the cinema, I honestly did not know whether I would be watching a drama, comedy, super hero movie or other, and as I soon found out, it really is a little bit of each of those genres. Birdman tells the story of Riggan Thomson (Michael Keaton), a washed up middle aged super hero movie star who is attempting to regain some career credibility in a theatre production of his own financial backing and creative direction. Every now and then there is a film that comes out during awards season accompanied with heaps of critical praise that, for some reason, I do not connect with. Birdman is definitely this year’s example.Though the picture is incredibly impressive in its technical prowess and utilisation of long takes and exceptional camera work as a whole, the film on a pure consumer level fell somewhat flat for me. The plot follows a loose thread of Riggan’s play being put through the process of previews, but the real heart of the piece is very much an exploration and critique of the unlikeable elements of both the film word and the theatre world. Surrounding the protagonist are a group of eccentric characters who all serve the purpose of portraying different themes including theatrical elitism, the negative impact of franchise based cinema and more human topics such as drug addiction, love, narcissism and self worth. Unfortunately, I feel as though the film never delves as deeply in to these interesting topics as some critics have suggested it does, and this is purely down to the fact that the filmmakers have tried to address so much that ultimately nothing stays truly resonant. This is not to say, however, that the film is completely without merit. Though I struggled to really connect with the piece as a whole, the film provides the audience with a wacky and at times fun experience, watching these characters spar with each other both verbally and physically is enjoyable, and the dialogue with which they are working is sharp and dry, ultimately I became confused by exactly what Birdman was trying to tell me, and in the moments that I had to remove myself from the experience to collect my thoughts, any real momentum that threatened to take off was quickly stalled. However, what leaves me torn and surprised is that for a film which did not strike a particularly positive chord with me, Birdman is filled with number of solo performances that I enjoyed immensely. Michael Keaton as Riggan Thomson is a perfect meta choice, with a certain ring of truth in the fact that he too experienced some of his greatest years of success as a franchise super hero. 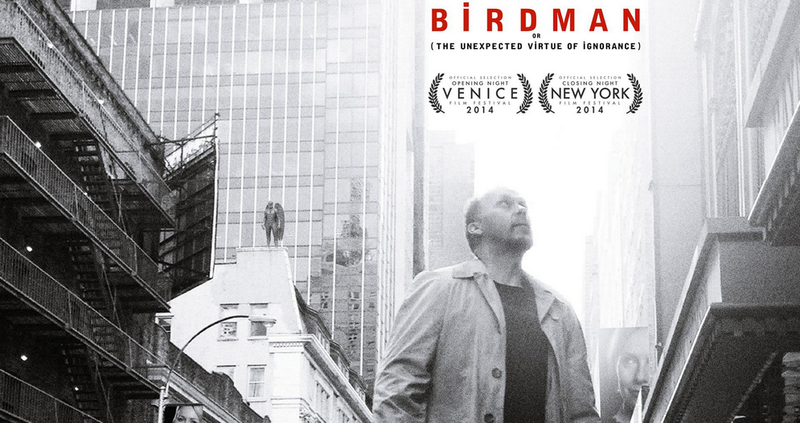 Birdman is arguably the best role of Keaton’s career, he gives a raw and authentic performance of an actor struggling with several different issues both personal and professional. You can expect his name to be among the Best Actor nominees this season. Edward Norton as divisive Broadway actor cliche Mike Shiner is as over the top, self absorbed and infuriating as you would wish a stereotype of that nature to be, proving to be an intriguing and enjoyable foil to Keaton throughout. Emma Stone stands out as Keaton’s daughter, fresh out of rehab and full of classic hate for her father that is rather refreshingly ridiculed, and I must give a special shout out to Naomi Watts who in playing Lesley, Mike’s girlfriend and fellow cast member, gives for the first time in I don’t know how many films, a performance that is enjoyable not for unintentionally comic reasons but for real acting talent. It is good to see that Diana didn’t ruin her for life. Overall, my relationship with Birdman seems to boil down to the cliche line of “it’s not you, it’s me”. I can absolutely understand why the film is receiving the amount of plaudits that it is, but for various reasons, namely the muddled and over crowded nature of the plot which I believe failed in its ambition to purvey a number of different messages, it left me rather cold. Having said that, the great performances by all of the central cast did provide me with some entertainment along the way, just not enough entertainment to sway my opinion that Birdman is just a touch overrated. Ultimately, my viewing experience was like looking at the recipe for some extravagant and odd dish in a cook book. I can see all of the ingredients involved and understand how well they combine to make something delicious. But unfortunately, that something delicious is a meal that did not satisfy my personal taste. I loved Birdman but I’m surprised it has been getting so much love. It doesn’t feel like a film that would normally get widespread love given all the themes it tries to address and the ways it goes about addressing them. I still think it’s still one of my favorites from the year. Luckily I heard very little about it before watching it so I had no expectations. I thought it was going to play out like the episode “Beware the Gray Ghost” from the Batman: Animated Series (http://en.wikipedia.org/wiki/Beware_the_Gray_Ghost). Well, you aren’t alone! My sister absolutely hated the film, so I’ve decided to steer clear of it, at least for now (I may be re-tempted if it gets a lot of buzz during awards season). Although I’m yet to watch this one, I think its overhype is going to kill it for me. Still, it would be interesting to see Ińárritu’s take on comedy after having seen his previous features which were way too hard-hitting & emotionally distressing! Spendid review, Amy. I couldn’t agree more with your view on Birdman. It didn’t touch me, but I still enjoyed the performances and did not feel bored as it kept you entertained in some way throughout! This was without question my favourite movie of 2014. I’m glad it won Best Picture and especially Best Original Screenplay. I loved it through and through.